You asked for it. We delivered it. 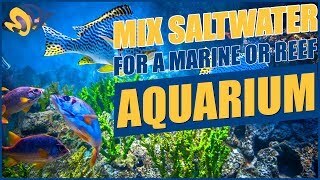 Brightwell Aquatics NeoMarine Salt Mix creates an ideal marine environment for aquarium inhabitants by providing all major elements, all non-conservative (depleted by natural chemical and biological processes) minor and trace elements, and elements known to be utilized in the production of biological pigments (biochromes) in precise natural seawater ratios; all ions are formulated to be present in natural seawater concentrations. Conservative minor and trace elements are not depleted in marine environments, indicating that they are not utilized by marine life or do not take part in chemical reactions in seawater; as such, they are not necessary for the survival of aquarium inhabitants, and are not part of the NeoMarine formulation. NeoMarine is not formulated to have enhanced concentrations of certain elements at the expense of sacrificing others and creating a solution with grossly inaccurate elemental ratios; this formulation is based wholly on current marine science data and extensive testing. NeoMarine is manufactured in Brightwell Aquatics’ production facility in Pennsylvania, ensuring that we maintain absolute control over quality; NeoMarine is not outsourced as many competing US-manufactured salts are. Additionally, elements are provided by individual salts (no seawater evaporite is used); this enables us to maintain a consistent formulation and appearance to the finished salt mix at all times. Ingredients are measured using an extremely accurate process, and each batch of NeoMarine is blended in a dry, clean environment. Our production process promotes uniformity of particle size and homogeneity throughout each container. Small batches are created and lot numbered to maintain the highest standards of quality control. NeoMarine utilizes ingredients of superior grades, and contains no detectable ammonia, nitrate, phosphate, or organic substances at standard specific gravity. It dissolves completely to create crystal clear water. NeoMarine has been extensively tested over a multi-year period with 100% success on all manner of marine invertebrates, fishes, and desirable algae; numerous species of fishes, corals, and mollusks have reproduced freely when maintained in water prepared with this salt blend. NeoMarine is formulated for all marine organisms, not just fish or reef inhabitants. i simply love this Salt, it is quick easy and seems to be very well controlled as I have yet to receive a "Bad Bucket of Salt." Mixes fast and easy, but does get very warm if you have water on your hands and you touch it. I tried this salt based on the favorable reviews. It dissolves completely not leaving a residue like other salts I've tried in the past. Highly recommended for the quality as well. I have used Neo Marine salt for 4 or 5 years now and I continue to have excellent results with water quality. It is my go to marine salt. Great price and very quick delivery.